British Labour leader says a Labour-led government would recognize an independent state of Palestine “as soon as we take office”. British Labour leader Jeremy Corbyn said on Wednesday that a Labour-led government would recognize an independent state of Palestine “as soon as we take office”. 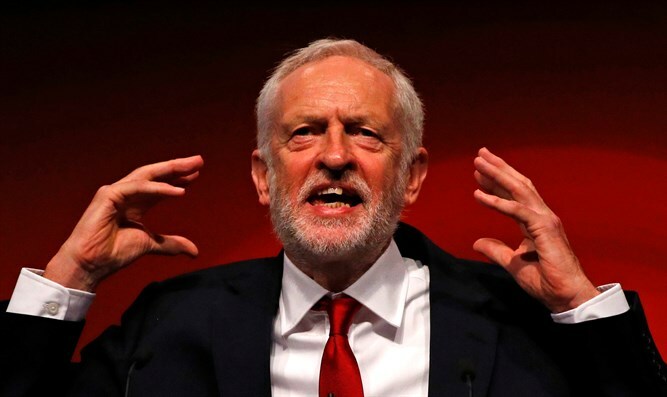 Speaking at a fringe event of the Labour Friends of Palestine conference, Corbyn threw his support behind a two-state solution, saying he wanted a “secure and viable” Palestine alongside Israel, according to the British Jewish News. Corbyn criticized US President Donald Trump for moving the US embassy to Jerusalem and cutting funding for UNRWA, the UN agency for “Palestinian refugees”. He also called for a “sustainable, just peace” with Israel after “51 years of occupation”. “But peace cannot be achieved with the existence of settlements, human rights abuses, and a disregard for international law by the current Israeli government, like last Sunday’s demolition of the Palestinian village of Khan Al Ahmar,” said Corbyn, referring to the illegally built Bedouin outpost near Jerusalem. “The security of one country can never be achieved at the expense of another and Britain has historic responsibility towards Palestinian people. We will continue to stand up for Palestinians, we will recognize an independent state of Palestine as soon as we take office,” he vowed. This past June, Corbyn said in a tweet that a Labour-led government would recognize “Palestine” as a state. His tweet came while on a tour of camps in Jordan for Syrian and people registered as Palestinian refugees. “Today I’ll visit the Al-Baqa’a refugee camp which was first created in 1968, where 100,000 Palestinians live. The next Labour government will recognize Palestine as a state as one step towards a genuine two-state solution to the Israel-Palestine conflict,” he wrote. Corbyn last November called for the UK to mark the 100th anniversary of the Balfour Declaration by recognizing “Palestine”. "Let us mark the Balfour anniversary by recognizing Palestine as a step towards a genuine two-state solution of the Israel-Palestine conflict, increasing international pressure for an end to the 50-year occupation of the Palestinian territories, illegal settlement expansion and the blockade of Gaza,” he wrote in a statement at the time. Previously, Labour's shadow foreign secretary Emily Thornberry similarly called on the British government to mark the 100th anniversary of the Balfour Declaration by formally recognizing a Palestinian state.